Customers today are bored! Blame it in part on their elevated standards for all customer experiences. To paraphrase the post-World War I song, “how you gonna keep ‘em down on the farm after they’ve seen…Disney World.” Part of their boredom is driven by their overstimulated, hyper-entertained daily lives. Stores have become sensory theater; TV and the Internet are as vibrant as Broadway after dark. Look at what it took to get on their feet the attendees at the Super Bowl half-time show—Katy Perry sky walking with pyrotechnics and riding atop a giant glass lion. But, the largest culprit driving customer boredom may be the absence of surprise in most of customers’ experiences. What is random about getting upgraded to first class as a frequent flyer with a coach ticket? You have the miles, the seat is available, and the computer delivers an upgrade. When randomness is gone, the well-intentioned value-adds become a standard customer expectation, adding no value at all. What is needed today is service with sprinkles. Service with sprinkles includes all those unexpected, inventive experiences we receive as customers. It is service with ingenuity, not just generosity. When my wife purchased a new SUV, a week after she had her new car she turned on the radio for a first time and discovered the service tech had programmed in her radio stations from her trade-in. She got great service from the dealership, like a good cupcake. But, good service turned into gourmet service when the tech added “sprinkles” to her experience! Wise organizations create cultures that arm frontline ambassadors with the capacity, authority and encouragement to deliver an innovative, unpredictable customer experience. 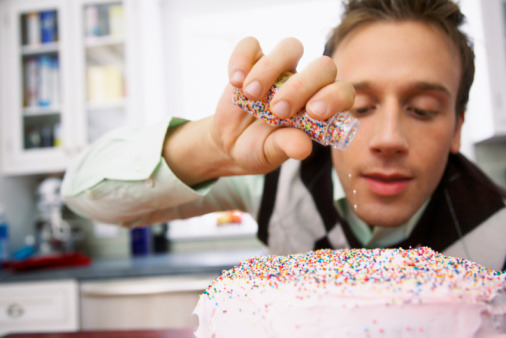 Instead of focusing only on good service with value-added extra (taking what customers expect and adding more), they create value-unique experiences—service with sprinkles on top! They understand the difference in inspiration between foreseeable value-added and random value-unique. Here are six ways to put surprise back in the gourmet mix for the pursuit of customer loyalty. When the only First Bank & Trust ATM in the rural town of Tahoka, Texas went down, customers were unhappy. They were forced to use the only other ATM in the area at a convenience store where fees were considerably higher. And, when it took several weeks to get the ATM operative, unhappy customers were accustomed to going to the convenience store for their cash. First Bank & Trust, headquartered in Lubbock, found a way to lure customers back to the bank’s ATM, “sprinkles.” The bank ran an ad in the local paper that told customers not to think it was a mechanical glitch if they received a fifty-dollar bill instead of a twenty-dollar bill when they used the bank’s ATM. Word spread as customers told neighbors when they hit the ATM jackpot! The value-unique was such a success at growing loyalty the bank expanded the concept to other branches throughout West Texas. Let Your Customers Lick The Beaters! On Southwest Flight 246 from El Paso to Phoenix, the flight attendant accepted assistance from two adoring passengers to help pass out peanuts to fellow passengers. The most important part of the occurrence was not the obvious fun the two guys in Bermuda shorts and ball caps had. It was the noticeable positive effect the incident had on everyone on board. Even super serious passengers could not help but grin as they received the all-too-familiar snack from the flight attendant-wannabes! Customers care when the share. Take the shuttle bus from the off-airport car rental lot to the Atlanta Airport terminal at Hertz and you just might get a great surprise—Archie Bostick. The first thing you see is Archie with a big, welcoming grin on his face––and he’s having a great time reinvigorating this simple, routine service transaction. Once onboard, Archie delivers a comedy routine instead of issuing the standard warning about the consequences of forgetting to turn in the keys to your rental car. As he pulls up to the terminal, he announces, “Now that we’re at your final destination, I may never see you again. I want us all to say together, ‘I love Hertz!’” He invariably convinces a crowd of strangers to holler, “I love Hertz!” before exiting his bus. As customers exit applauding, they realize they have just witnessed a passionate service innovator at work. Customers are weary of stressful service. Lines like: “Your call is very important to us,” “We are experiencing unusual call volume,” “Complete this form,” or “Did you have an appointment/reservation?” all signal dreaded effort, hassle or frustration is on the other side. Some research shows that effort (being easy to do business with) today trumps practically every other feature of basic customer service. Today’s customers expect experiences to be sparkly and glittery with sprinkles on top. Meeting the challenge of rising expectations requires rethinking the role of those employees who are face-to-face, ear-to-ear and click-to-click with customers. When service people are asked to give more, they often think, “I’m already doing all I can.” But if asked to pleasantly surprise more customers, they feel less like worker bees and more like fireflies. Invite employees to create not just execute and they will feel esteemed…and, their customers will feel they hit the jackpot. Chip R. Bell is a renowned keynote speaker and author of several bestselling books. His newest book is the just-released Sprinkles: Creating Awesome Experiences Through Innovative Service. He can be reached at www.chipbell.com.